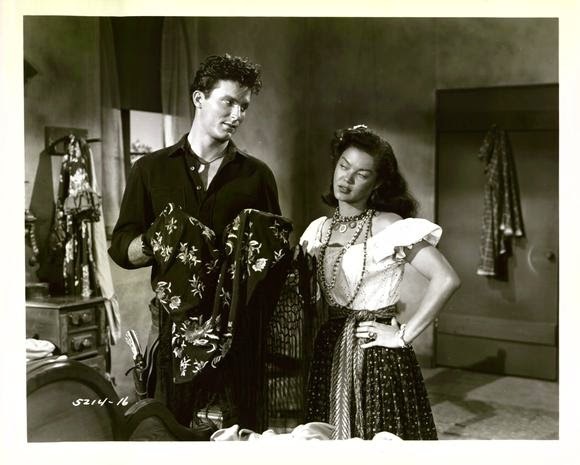 Keith Larsen stars as "The Kid" in SON OF BELLE STARR (1953), an Allied Artists Western recently released by the Warner Archive. The movie feels a bit like a guilty pleasure, cheaply made and with a few supporting actors who aren't especially scintillating, but I must say that I rather liked this movie. The faded green and orange pastel Cinecolor look appeals to me very much, while Larsen -- recently seen in ARROW IN THE DUST (1954) -- is pretty good as the unpredictable Kid. There's a pair of interesting leading ladies in Peggie Castle and Dona Drake, a couple of arresting love scenes, and supporting favorite Regis Toomey pops up here and there. The movie knows not to wear out its welcome, running a fast-paced 70 minutes. For me all these factors added up to a nice slice of "Western comfort food." In SON OF BELLE STARR the ostensible "good guys" are the villains, while the man everyone thinks is an outlaw, the Kid, is on the side of law and order. The crooked sheriff (Myron Healey) brings the Kid in on a deal to rob a stagecoach of $100,000. The Kid pretends to go along with the deal, but he's actually out to find the person who framed him for a robbery the year before. He stashes the money safely away while working to uncover the anonymous mastermind who set up both crimes. The Kid has a steamy but uncommitted relationship with fiery Dolores (Drake), and she's financially tempted to betray him. But no matter, he discovers that Julie (Castle), the seemingly prim daughter of the town newspaper publisher (Toomey), kisses much better than Dolores anyway. Unfortunately Julie's engaged to George (James Seay)...and George just might be Mr. Big. This was a satisfying movie with a nicely wrapped-up plot. The only thing I didn't care for was how the movie ended, but even then, I admired the way the music and the movie quietly faded out. 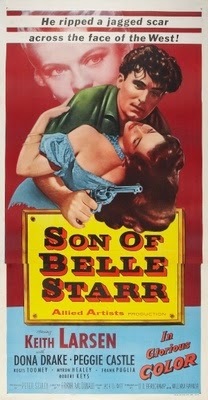 SON OF BELLE STARR was directed by Frank McDonald and filmed by Harry Neumann. The script was cowritten by D.D. 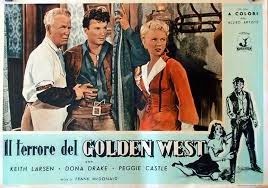 Beauchamp, who wrote some very good '50s Westerns such as RIDE CLEAR OF DIABLO (1954) and RAILS INTO LARAMIE (1954). The Warner Archive DVD is in fine shape, acknowledging the inherent limitations of unstable Cinecolor prints. Some of the opening credits are a bit faded, but I found it added to the film's overall Cinecolor charm. There are no extras. 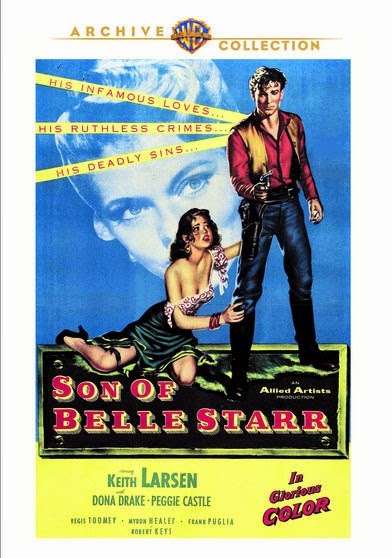 I love the fact that relatively obscure films such as SON OF BELLE STARR are once again available to viewers thanks to the Warner Archive. There are more treasures coming from the Archive in the near future, including "B" gems such as TWO O'CLOCK COURAGE (1945), CRIMINAL COURT (1946), and THE CLAY PIGEON (1949). This film is high on my shopping list, Laura, and your review serves to make me want to get shopping SOON! I am also excited by your news of those 3 upcoming releases from WA, especially "Two O'Clock Courage", which I have not seen for many years and have been wanting to get my mits on! So much great stuff coming out now, tempting the budget to badly overspend. I had a good time with this one, Jerry. Hope you'll enjoy it too. So glad I could share the good news about TWO O'CLOCK COURAGE and other forthcoming WAC titles! !